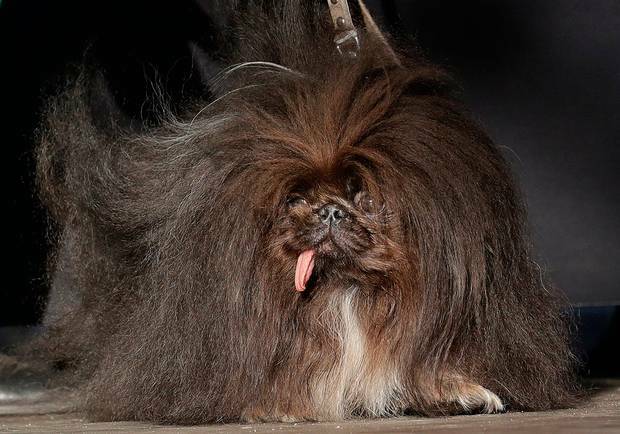 There are some faces only a true dog lover could love (such as the worlds ugliest dog breeds). 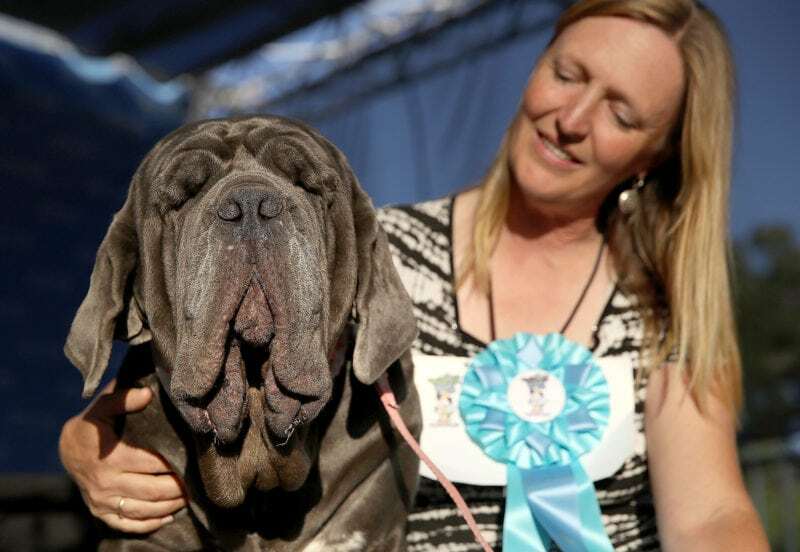 The winners of Petaluma’s annual The Worlds Ugliest Dog Contest are a few. 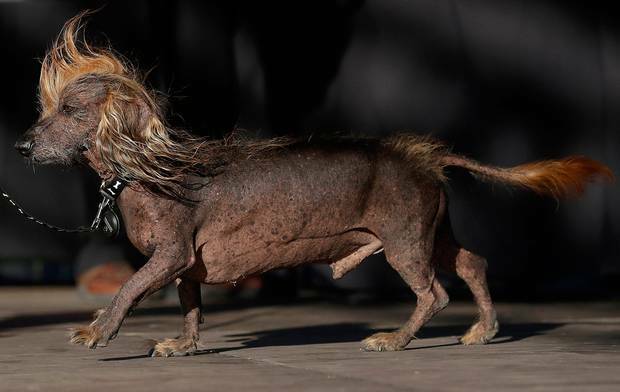 A competition that began in the 1970s as a satirical take on the more prestigious dog shows, The World’s Ugliest Dog Contest takes place every year as part of the Sonoma-Marin Fair. The winner not only gets the prestigious title but gets to take home a trophy and upwards of $1,000 in prize money. 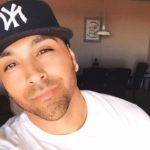 Let’s take a look at some of the faves from this year’s contest, as well as winners from the past. Zsa-Zsa was an English Bulldog, rescued from a puppy mill where she had been bred for five years. 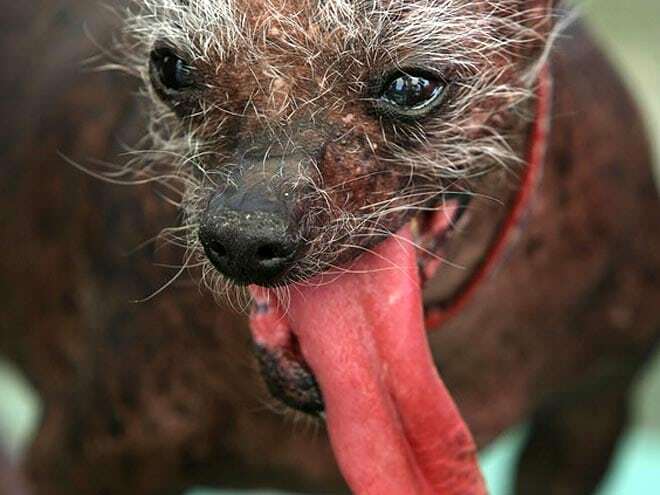 Sadly, Zsa-Zsa passed away shortly after winning the title of World’s Ugliest Dog. 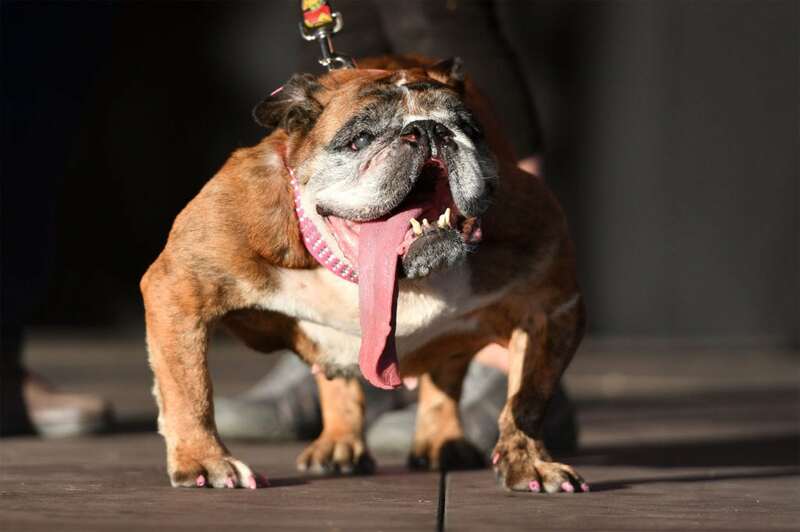 Not only is she the World’s Ugliest Dog but she has the world’s longest tongue. Described as “gentle,” “gassy” and “slobbery,” Martha is a 125lb Neapolitan Mastiff. While she took home the title in 2017, she was beaten by Zsa-Zsa when she tried to win the 2018 title. Under all that fur and skin, are there even eyes? After placing second in 2015, Sweepee Rambo came back to win the contest in 2016 at the ripe old age of 17. Sadly, she too passed away shortly after taking home the coveted title. Can you count the hairs left on her head? Quasi Modo was born with a birth defect, which caused his hunched back and led to his name. 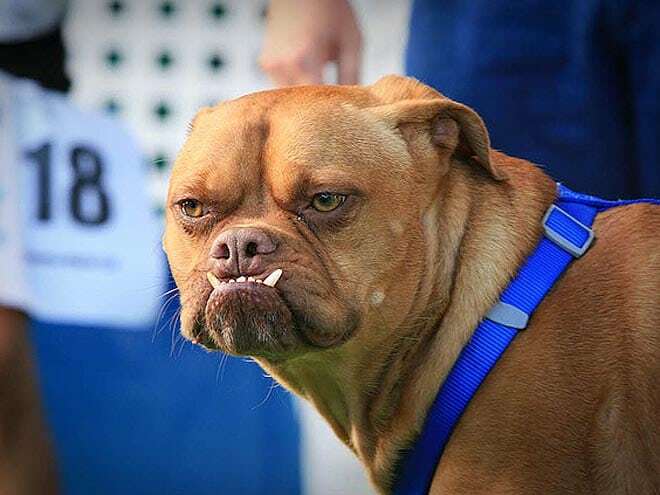 In 2015, he beat out 26 other ugly pups to take home the title of World’s Ugliest Dog. Peanut is a 2-year-old mutt. He was the victim of animal abuse and burnt in a fire. His owner, Holly Chandler, hopes Peanut’s victory will bring more attention to animal abuse. 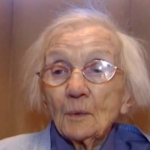 She donated the $1,500 prize money to other pets’ veterinary bills. 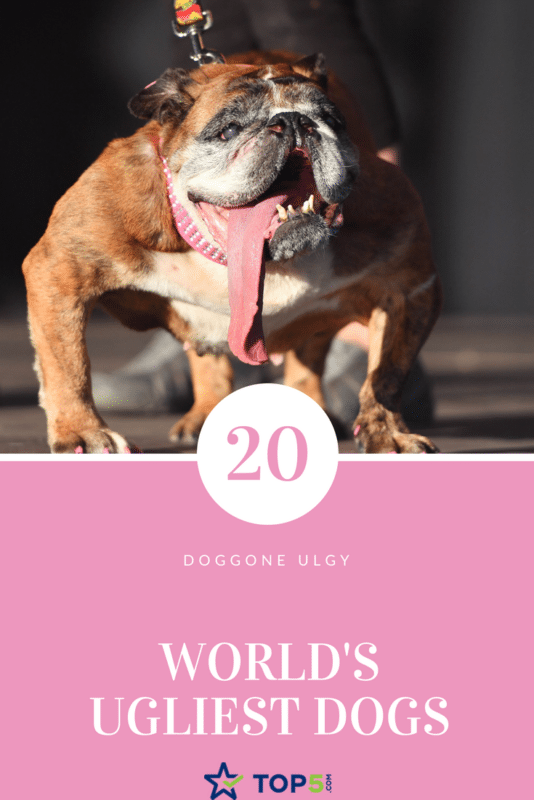 Hailing from the U.K., Mugly traveled to the U.S. in 2012 to take home the prize of World’s Ugliest Dog. 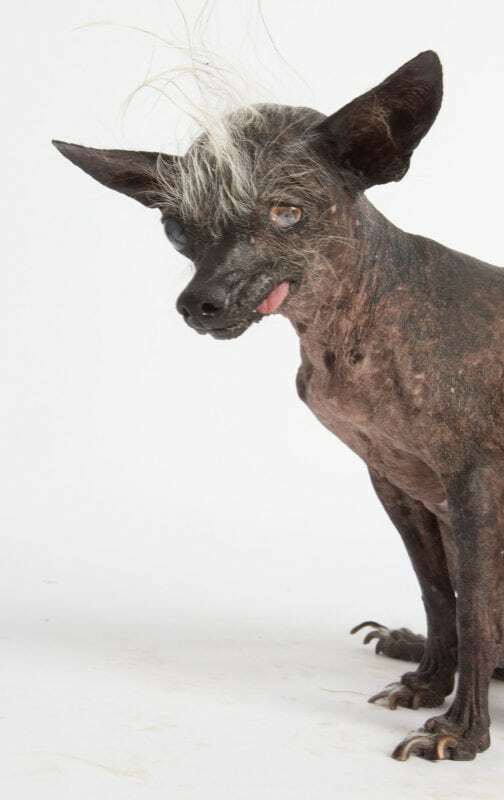 Yoda was a 14-year-old mutt who took home the title of World’s Ugliest Dog in 2011. Abandoned by her owners in California, she was found behind an apartment building by Terry Schumacher, who first mistook the mutt was a rat. Thankfully Ms. Schumacher quickly realized she was not a rat and went on to adopt her. 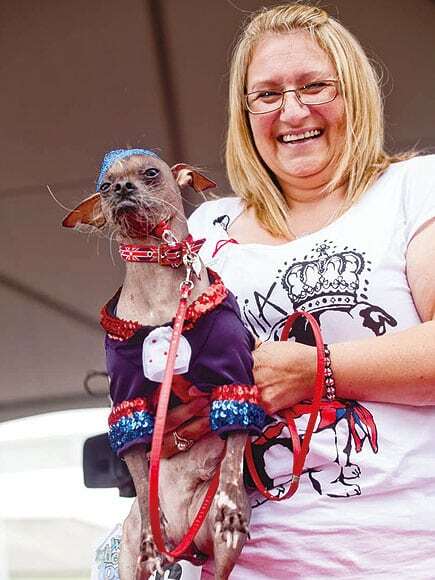 Princess Abby took home the coveted World’s Ugliest Dog title in 2010. While she appears to be bowing to her fans, she actually suffers from a birth defect: her hind legs are taller than her front legs. 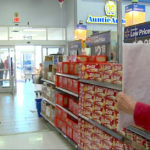 Vet Doc Halligan suspects her ailment is due to inbreeding, saying “She’s a poster child to spay and neuter your pets,” she said. 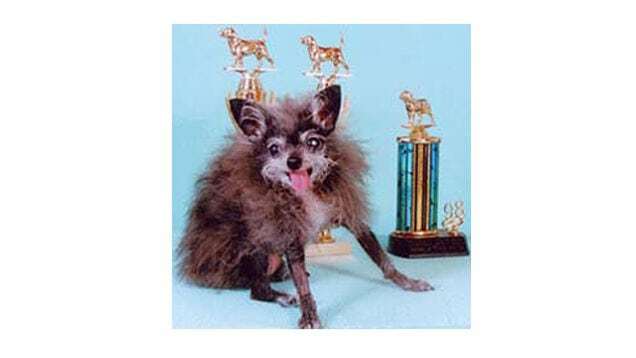 With his adorable underbite, Pabst (named for the blue ribbon beer), took home the blue ribbon of the dog show in 2009, beating out the previous years Chinese crested. 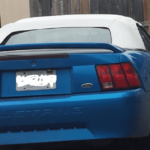 Apparently, someone likes Pabst Blue Ribbon — enough to name their dog after the beer. 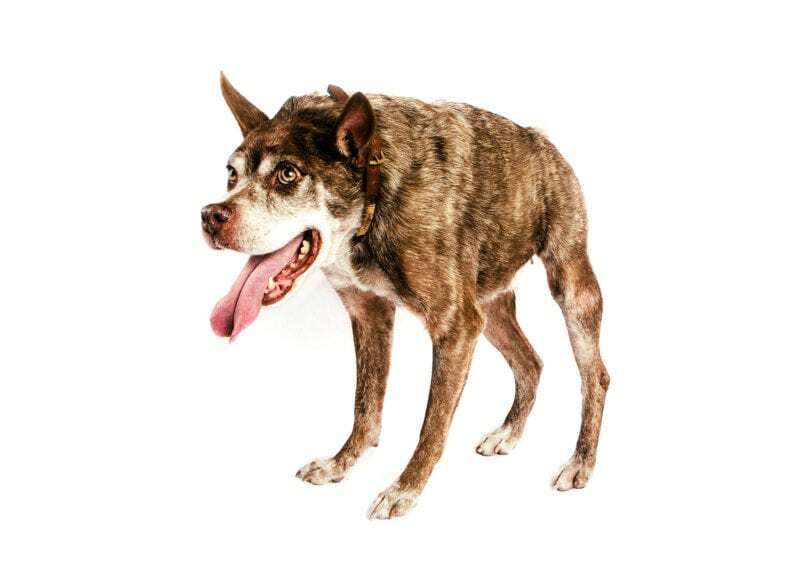 Gus was a one-eyed, three-legged cancer survivor when he took home the title of World’s Ugliest Dog in 2006. 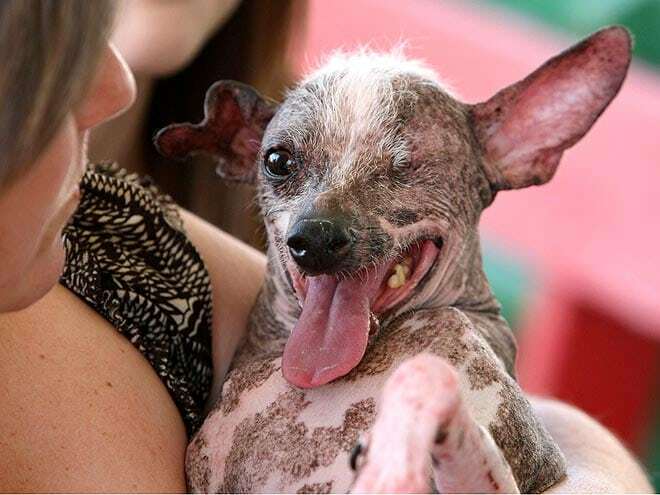 A rescue dog, his owner used the money for his skin cancer treatments. Although he’s quite ugly you have to admit he’s pretty cute! 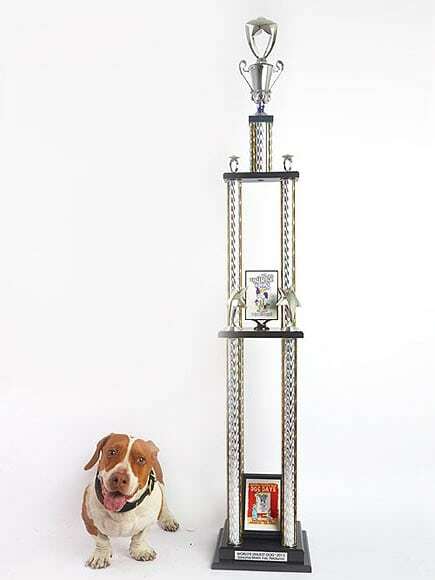 Elwood was 2 years old when he took home the prize in 2005. At 9 months old, he was nearly euthanized by his breeder for being “too ugly” but saved by Karen Quigly. 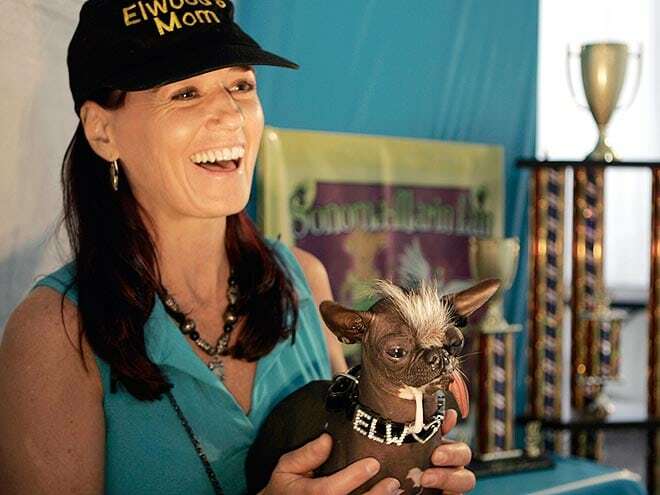 She used his story to promote animal rescue groups: he made appearances at more than 200 charity events, and was even the inspiration of the children’s book, Everyone Loves Elwood, which promotes a message of anti-bullying and compassion towards animals. Archie is another lovable mutt who was saved from death row and adopted. The hairless, toothless pup with the long tongue is another example of overbreeding: he’s actually a purebred Chinese-Hairless. You have to admit, despite the ugly, he is pretty adorable. 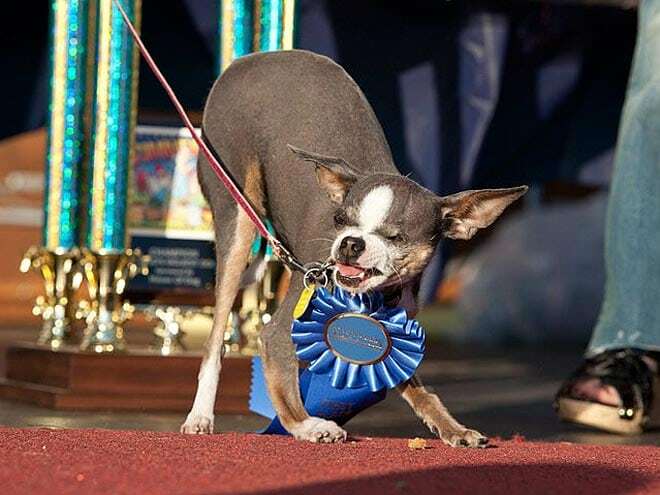 One look at Sam, a blind rescue dog, and it’s easy to see why he took home first place for three years in a row. Sam passed away from cancer in 2005, just before his 15th birthday. In the years prior, he gained additional celeb-status with appearances in an A&E Halloween special, as well as a Japanse television show. Rascal took home the blue ribbon in 2002 and went on to star (or, participate) in several films. He’s the only dog on our list with his own IMDB page for roles including! A purebred, Rascal is naturally hairless, aside from his mohawk, and wears his warts and skin spots proudly. 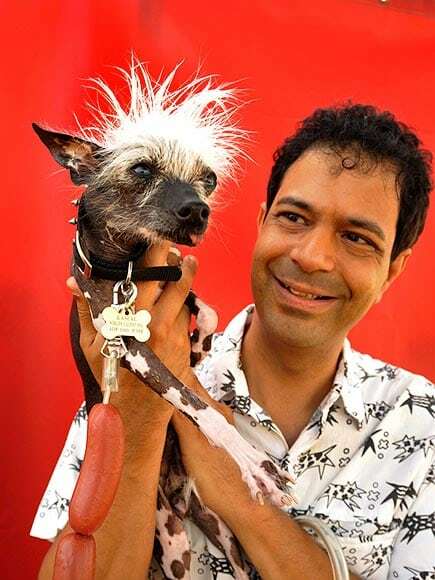 In addition to the 2002 World’s Ugliest Dog title, Rascal appeared with Jay Lenon the NBC Tonight Show, “interviewed” by ‘Barbara Walters on The View, appeared on The Jane Pauley show, Carson Daly, Animal Planet, Kathy Griffin’s D-List, ET and more. Not surprisingly, he also had guest roles in 5 horror movies! 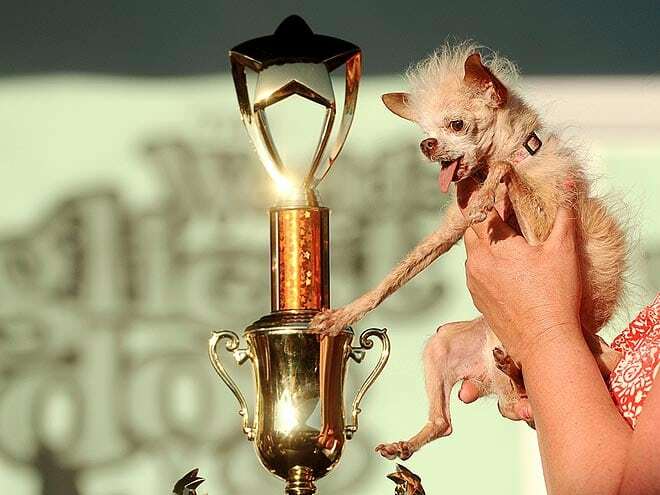 The pint-sized pup, weighing just 4 lbs, was a shelter rescue and took home the title of World’s Ugliest Dog for two years in a row. 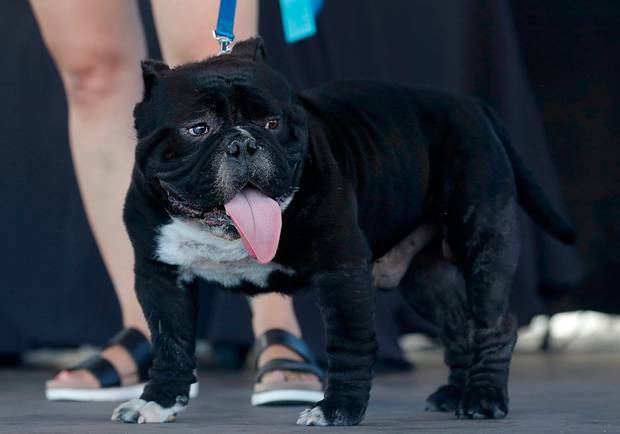 Himisaboo competed in both the 2018 and 2016 World’s Ugliest Dog Contest. While he may not have taken home a trophy, he was a fan favorite thanks to his golden mane, which many likened to Donald Trump’s. 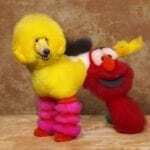 “Whether you love him, or loathe him, a vote for Himisaboo is a vote for a dog that looks like Donald Trump,” said Heather Wilson, Himisaboo’s owner, when he competed in the 2016 contest. Meatloaf, affectionately known as “Snorlax” thanks to his heavy breathing, was another fan favorite. Meatloaf’s owners were hoping to take home the prize money to pay for his upcoming eye surgery. That tongue is something else. Wild Thang is an unkempt Pekingese in desperate need of a brush (or haircut). With that lolling tongue and mangy mane, it’s easy to see why the crowd loved her! Better luck next year, Wild Thang. 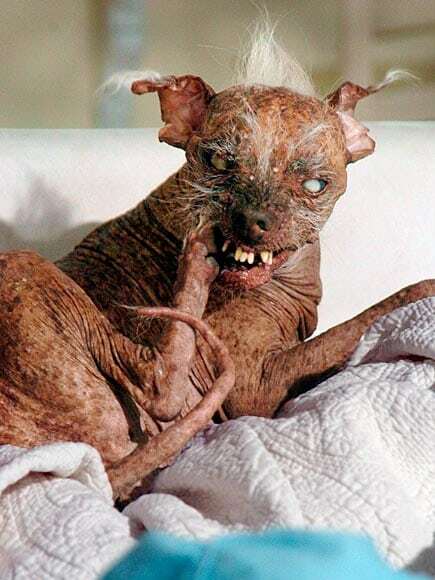 This is easily the furriest of the ugliest dogs out there. 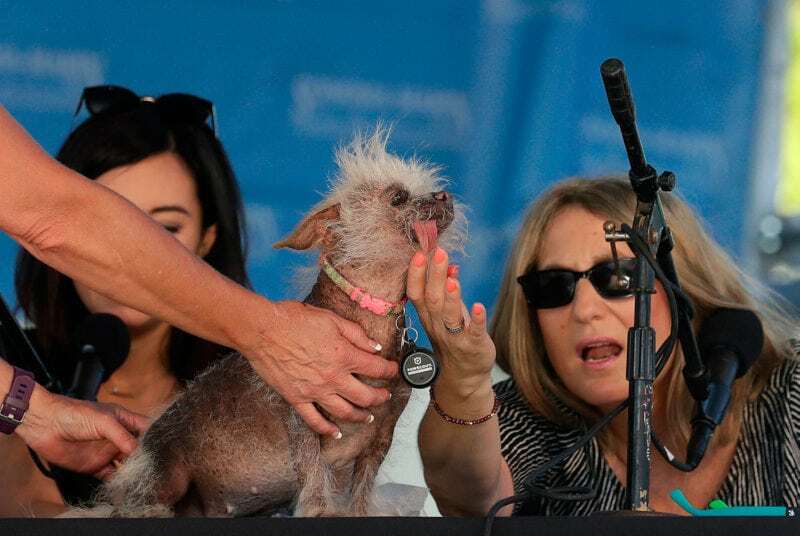 Josie was another Chinese-Crested competitor in this year’s World’s Ugliest Dog Contest. While the odds were in her favor as the judges seem to love Chinese-Crested pups, unfortunately, she did not place. 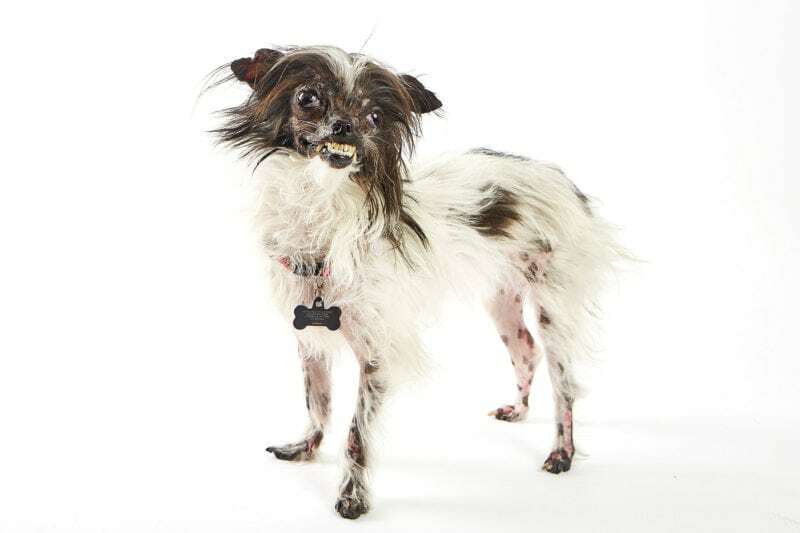 Do you have a lovable mutt with a mug worthy of being named World’s Ugliest Dog? Tell us in the comments and share a photo!